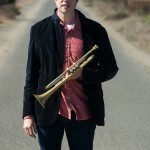 I had the pleasure of recently doing a photo shoot with trumpeter Ian Carey. He is preparing for his next CD release in 2013. We did our shoot on the San Francisco Bay Trail – East Bay in Richmond, CA.